Mike Griffin had a bad outing on this day in September 1987. The whole Baltimore staff had a bad outing. Baltimore pitchers gave up a record 10 home runs on the day, one of them given up by Griffin. "It's plain and simple," Giffin told The Associated Press afterward. "You can't make too many mistakes in baseball at the major league level." Griffin went on to use the knowledge he gained in his six seasons in the majors to try to get others to the majors. After his playing career ended in 1989, Griffin became a minor league coach, winning awards in the process. It's also a job he continues in 2014. Griffin's career in baseball began in 1976, taken by the Rangers in the third round of the draft out of Woodland High School in California. Griffin played his first two seasons at single-A Asheville, going 17-9 his second season. He made AA Tulsa in 1978. He then made AAA and then the majors with the Yankees, arriving there in a 10-player deal. Griffin made his debut in September 1979, getting three relief outings. He returned to the Bronx for another 13 outings, nine starts, in 1980. He arrived mid-season 1981 with the Cubs in another trade. He picked up a save in an August game, after play resumed from the strike. "I'm just anxious to get off to a good start and get work," Griffin told UPI after that game. "I think I need a couple more outings before I get my really good stuff." Griffin got 16 outings, nine starts for the Cubs down the stretch, with a 4.50 ERA. He moved to the Padres for 1982, getting seven outings there. He then didn't return to the majors for another five years. In the meantime, he played in the Expos, Rangers and Royals systems. In 1987, he signed on with the Orioles, getting called back up in late-June. In 23 outings, six starts, for Baltimore, Griffin went 3-5, with a 4.36 ERA. He then got his final major league time in 1989, three outings with the Reds. 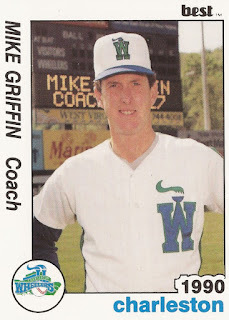 His playing career over, Griffin moved into coaching, though he hasn't made the majors as a coach. He spent time in 1990 as coach for the single-A Charleston Wheelers. By 1993, he was pitching coach for the Reds at AAA Indianapolis. Still in Indianapolis in 1995, Griffin tried to get former first-round pick Roger Salkeld back to the majors after injury. "Nobody wants to get hurt, but I think the injury helped Roger in that he no longer could just rear back and fire fastball after fastball," Griffin told The Los Angeles Times. "I saw him in '91 when he was with Jacksonville, and he threw hard. But now he's had to develop four pitches and rely on the location of that fastball. He had to become a pitcher and not just a thrower." Griffin moved to AA Trenton and the Red Sox by 1999 and AAA Pawtucket in 2003. He arrived with the Orioles in 2008 at AA Bowie. In 2009, he moved to AAA Tidewater, where he remains for 2014. In 2009 and 2010, Griffin won the Orioles' Cal Ripken Sr. Player Development Award. In 2011, Griffin worked with Brian Matusz to get him back to the majors after a rough stretch. Griffin told MLB.com that he knew Matusz could get back. "There's various spots in pitchers' careers where you get into a little bit of a rut and sometimes you have to go to the Minor Leagues and work it out," Griffin told MLB.com. "Many a pitcher has done that and come back and be very successful, and I see all of that with Brian Matusz."